One day she saw the crowds of pilgrims preparing to go to Jerusalem, to celebrate the Feast of the Exaltation of the Cross. She went along, announcing to her fellow travelers, "I have a body and that will serve as both fare and food for me." The trip was an eventful one, as Mary explored the outer limits of lust and passion with her companions (both those who were willing and those who were not). In Jerusalem, when the day of the Feast came around, Mary too set off for the church, drawn by the energy of the crowds thronging to venerate the True Cross. At the doors of the church, at its very threshold, Mary was driven back "by some kind of force." Trying with all her might, she could not enter, although those around her went in with no difficulty at all. Then she understood: it was her own self that prevented her entrance, the sinfulness of her life that held her captive outside the church. Praying fervently to the Virgin Mary, with her heart open and clear, Mary begged forgiveness and again sought entry at the church.Guided then by a vision of the Theotokos, Mary left at once for the desert beyond the Jordan River, for there, her vision told her that she would find rest. On the way, she stopped at a church built on the river banks; there she receiving baptism, and partook of the Eucharist in that church. From there, she came to the desert, led still by the vision of the Blessed Virgin Mary. The desert became her home, the place where she found her rest. Her conversion and turn to the life of solitude were unknown to any other living being, until after forty-eight years the priest Zosimas came and found her. When Zosimas first found Mary he did not know who she was, and she had never seen him. But she knew him before he had even spoken to her, and addressed him by name, "Father Zosimas, forgive me." The priest was struck with dread: was she an angel? Mary, for her part, was alarmed because of her nakedness, and begged him to lend her his cloak so that she could stand in modesty before him.He was alternately terrified and wonderstruck as he watched and listened to her. She knew all about him - about his life as a priest and the monastery in which he lived, and she clearly understood it all better than himself. When she prayed she levitated. Although illiterate and unschooled in Christianity (she had, after all, fled to the desert as soon as she converted) she was able to quote scriptural proofs for her teachings. But most of all, there was the enormity of her story. Zosimas drew out from her (much against her will) the details of her former life and her conversion; and he questioned her closely on the hardships of her desert life through those many years. She described her harlotry openly, as well as her life in the desert; how hard it had been, the suffering from cold and heat, hunger and thirst, temptation, longing for company and comfort; and yet her determination to live out her repentance in a manner suitable to her sin. She did not see, though Zosimas could, that she had attained a degree of sanctity that could only be measured by the degree of sinfulness she had known. For unlike him, she had no illusions about her accomplishments. She knew only the truth of God, and her love for Him. Then she asked a favor, for she understood that the Lord had sent Zosimas for a purpose. She asked him to return to his monastery and tell no one about her, but in a year's time return to her on Holy Thursday, the night of the Last Supper, and bring her the Eucharist, of which she had not partaken of since her conversion many years ago. Reluctantly, Zosimas left her presence in the desert for the monastery. At last he returned at the appointed time, yearning for her presence. She came to him, walking on water to cross the Jordan while he again gave way to awe. As he knelt to reverence her she reproved him saying, "What are you doing, Father Zosimas, you who are a priest of God and carrying the holy mysteries?" And at once he obeyed her, resuming to his priestly duties with fumbling fervor. Mary received the life-giving gifts of the sacrament, groaning and weeping with her hands held up to heaven, and she cried out, "Lord now let your servant depart in peace, according to your word: for my eyes have seen your salvation. "Again she sent him away, to return again the following year at the same time. But when the time came and Zosimas hastened on his journey, he found his beloved guide dead, with a letter to him written in the sand beside her body. From this he learned that she had died within an hour of receiving the sacrament the previous year - the fulfillment of her hope. He learned, also, for the first time her name: she signed herself "Mary the sinner." Grieving and marveling, Zosimas buried the holy woman helped by a lion who came to venerate the body of the saint. Then, he went back to the world to give the gift of her story to others, just as she had given it to him. Therefore your spirit, holy mother Mary, rejoices with the angels! you defeated demons with the weapon of the Cross. Therefore, most glorious Mary, you are a Bride of the Kingdom! 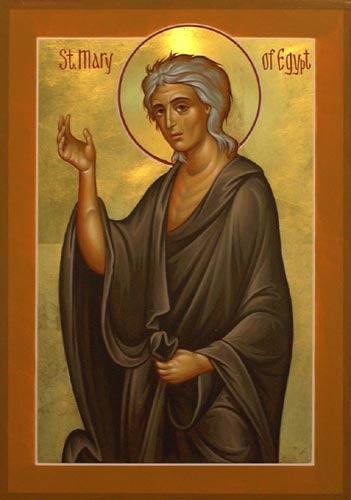 St. Mary of Egypt is celebrated April 1st and the 5th Sunday of Great Lent. She was chosen as the patron saint of CSME because of her life of communion with Christ in the desert.